It's easy, if you would like to order one of the rosaries in my DESIGNER COLLECTION, simply email me at the address below and refer to the rosary by number or description. All Designer Rosaries, whether shown WIRE WRAPPED or BEADED ON FLEXWIRE, are available in WIRE WRAPPED construction ONLY in the IDENTICAL DESIGN in Sterling Silver. I NO LONGER MAKE BEADED ROSARIES. Many DESIGNER ROSARIES are also available in PEWTER or BRONZE with standard chain link construction. Pewter may not be shipped to addresses in California, Minnesota and Illinois. Pewter is not intended for children. There is no restriction on Bronze. Silver Plate is also available, but not in the same style crucifix and centers. BRONZE and SILVER PLATE are also available with wire wrapped construction. See the BRONZE & PEWTER page. Please understand that ALL ROSARIES ARE MADE TO ORDER. Aside from items on the "Ready to Ship" page, nothing is pre-made. 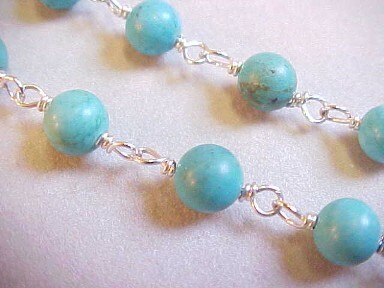 My AVERAGE WAITING LIST IS ABOUT 6-8 WEEKS from the time I receive your payment until I can make and mail your rosary. There may be times that, due to high volume of orders, it may take longer. NOTE: Current expected waiting list is approximately 8-10 weeks, and may be more for special orders. Magnificat Rosaries does NOT sell or rent customer email addresses to anyone else. We retain our valued customers email addresses ONLY for the purpose of sending you future updates and special sale offers from Magnificat Rosaries. You may opt out of receiving future emails from Magnificat Rosaries at any time. Wire wrap looks similar to regular chain rosaries, but instead of just hooking the beads together like a hook and eye and closing the hook, the wire crosses over itself and goes around itself several times at the base of the loop next to the bead. This construction cannot come unhooked. Wire wrapped rosaries cost more because they take 6 hours longer to make than regular chain link rosaries and use twice as much sterling siver wire. Each rosary, whether one shown in my DESIGNER COLLECTION or one designed especially for you, is hand made to order. Custom Orders are NOT returnable or exchangeable. Items made as shown incur a 20% restocking fee if returned within 15 days from shipping or 10 days from receipt. I guarantee my rosaries to be as advertised and free of defect in workmanship. My rosaries are well made and long wearing. If your rosary ever breaks, I will fix it FREE, as long as you return the crucifix, center, and all the beads to me. Priority Insured Mail - flat rate $10 (within the continental United States only), which includes packaging, postage and insurance for each order. If you order more than one rosary at the same time, I will pay the additional shipping and insurance. Priority Mail is usually delivered in 2 - 5 business days. International Insured Mail - $38 to anywhere outside of the Continental US. Delivery time depends on the country it is delivered to. Many countries detain packages in their customs inspection. NOTE: The cost of international insured mail has gone up to over $40 to most countries, but I am paying the difference. Please indicate whether you need US domestic or International mail when you order. I use only the US Postal Service. I do not have accounts with other carriers. I bill by PayPal, a secure payment site. I will send an invoice to your email and you can follow the link to the secure payment site and pay it with either credit card or e-check. You do not have to open a PayPal account in order to pay it. However, if you have a PayPal account under a different email than the one you use to place your order, PLEASE PROVIDE YOUR PAYPAL EMAIL WHEN YOU ORDER. As PayPal is my only business account, I cannot accept checks or money orders and I am not set up to process credit cards myself. ALL PAYMENTS MUST GO THROUGH PAYPAL. Please do not send money ahead of receiving the invoice. Each STERLING SILVER DESIGNER ROSARY comes with a black velveteen pouch and a black velour hinged jewelry case. BRONZE ROSARIES, PEWTER ROSARIES, SILVER PLATED ROSARIES, ROSARY BRACELETS and TRINITY BRACELETS come with a cardboard gift box. Please note that the special order heirloom parts, hand cast from vintage rosary components, are available as matched sets only. I also have many other beads that are not shown on my website and can special order many others. Please inquire about availability. A SPECIAL ORDER FEE of $10 will be applied to cover shipping of parts or beads to me. SPECIAL ORDERS must be pre-paid, in full, before I order the special beads or parts for you, as I will have to pay for them and pay shipping to get them. PLEASE ALLOW EXTRA TIME FOR SPECIAL ORDERS. Anything you want to see, please let me know. If I have or can find a picture of the beads you would like to see, I will email a picture to you. Our Lady of Grace Rosaries - quality handcrafted nickel and bronze rosaries, chaplets, rosary bracelets, crucifixes and other Catholic items, including over 100 different chaplets. Lewis & Company - beautiful selection of sterling silver, pewter and base metal crucifixes and centers, a variety of beads and findings, mission kit materials and the best directions anywhere for making a chain link rosary.